The April issue of this Newsletter carried two reports on the recent Opening of the Methodist Ecumenical Office in Rome (MEOR). They described the worship service in the English-speaking church at the Ponte Sant’Angelo, and the reception by Pope Francis the following day. Cardinal Kurt Koch, President of the Pontifical Council for Promoting Christian Unity (PCPCU) also sent us a letter of greeting, and, of course, Pope Francis addressed us when our delegation sat with him in his reception room in the Vatican. There was a common thread to their messages which members of our worldwide community should hear. He then put some straight questions to us: ‘What will be the role of the MEOR? What need does it meet? What opportunities does it create?’ He welcomed the meeting of the Officers of our Council which met in Rome during that week, and hoped that we would bring other committees and groups to meet there. The MEOR is situated in the five-storey apartment building which is Methodist property. The Minister’s residence is there, and now a suite of rooms for conferences, committees, and accommodation for pilgrims, students, sabbatical clergy and much more. Its church is the worship place for a local multi-ethnic congregation, which is part of the local circuit of the Italian Methodist churches (OPCEMI). Methodism in Italy dates back to 1861 and the work of British and American missions who came to work with the native Italian Waldensian Church. 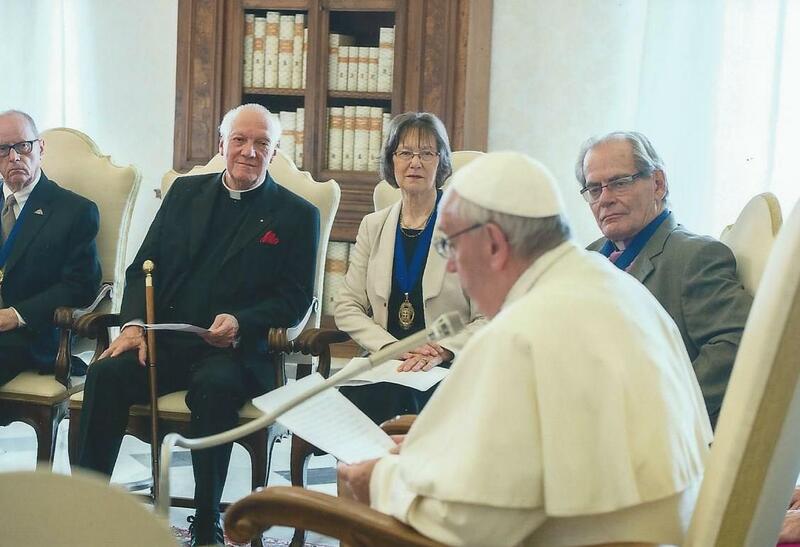 When the Pope invited our delegation, he was recognizing for the first time the ministries in Rome of the Italian Methodist Church (including its President deacon Alessandra Trotta), and representatives of the British Methodist Church and the United Methodist Church, as well as officers of the WMC. I was particularly touched by this, because when the idea was first mooted, some ten years ago, Catholic leaders in Rome and Methodists elsewhere had little idea that there were Methodists in Italy! Now to the common theme of the Cardinal and Pope Francis. The Pope also welcomed the MEOR: ‘It is a sign of our growing closeness, and particularly of our shared desire to overcome all that stands in the way of our full communion.’ Both leaders noted that our international dialogue was approaching its 50th anniversary. The Methodists were among the earliest to respond to the call of the Second Vatican Council to meet in dialogue, and our forthcoming Council in Houston will receive its Tenth Report. Koch put this challenge: ‘the members of that Commission [for dialogue] have long recognized that their work serves little purpose unless agreements are made widely known, and become the basis for prayer, discussion and action at all levels of ecclesial life. Pope John Paul II, addressing the Joint Commission in December 1980 urged them to “Do all in your power to ensure that your search for reconciliation is echoed and reflected wherever Catholics and Methodists meet”’. All our dialogue groups are aware of this shortcoming in our work. Much has been achieved in mutual understanding and the healing of memories. Much has been articulated that we can affirm together. But we have not found the way, or the financial backing, to make these reports (Catholic, Anglican, Baptist, Salvation Army…) better known, or even more, to produce material which digests them (though they are less complicated than many think!) and translates them into ministry in local contexts. How do we get their messages out? I hope that delegates to the forthcoming Council might bring some answers. Join us at the World Methodist Conference for the workshop The Call to Holiness: Methodists and Roman Catholics in Dialogue led by Rev. Dr. David Chapman (WMC Ecumenical Relationships Committee) and Rev Fr Anthony Currer (PCPCU). Next year, 2017, will mark 50 years of the World Methodist Council’s dialogue with the Catholic Church!